The Eternity knot symbolizes the never-ending essence of life. Constructed using a single strand; thus demonstrating that it has no beginning nor ending...(follow the line with your finger you will arrive back to where you started.....continuous). Finished with danish oil and complete with wall hanger on the reverse. 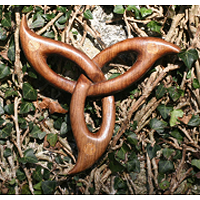 Produced from native Irish hardwoods. Allow 3 days for delivery, as this piece is hand-carved to order. The Eternity knot symbolizes the never-ending essence of life. Constructed using a single strand; thus demonstrating that it has no beginning nor ending...(follow the line with your finger you will arrive back to where you started.....continous). Finished with danish oil and complete with wall hanger on the reverse. 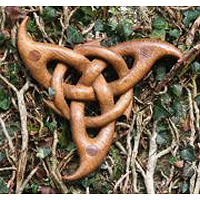 The Trinity / Eternity knot symbolizes the never-ending essence of life. 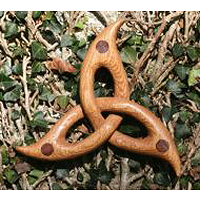 Constructed using two strands; One forming the Trinity knot and the other forming the ring around the knot, thus demonstrating that the trinity whether Christian or pre-Christian is at the very centre of the Universe symbolized by the ring of Eternity. Finished with danish oil and complete with wall hanger on the reverse.